Winfield Township offers brush and leaf pick-up as a service to residents in the unincorporated areas. The Township has not been directed by DuPage County to offer these services and the Township is not reimbursed by the County for the cost of supplying these services. Therefore, we ask for your cooperation in following the guidelines. The Township Brush Removal Program is for the homeowner’s convenience. We have a brush chipper designed to chip those limbs and branches that do not qualify as YARD WASTE. Our equipment is not designed to grind small twigs and evergreen trimmings. Your garbage service will take yard waste and roots for nominal cost. IF IT CAN BE PUT INTO A BAG, THEN IT IS YARD WASTE. WHEN: Brush is picked up four (4) times a year which begins the first Monday of April, May, September and October and it takes approximately one week per month to pick up the Township. WHAT: Brush is hereby defined as trimmings from bushes or shrubs, as well as tree branches from trimming and/or pruning trees. Not considered to be brush are logs, root balls (not dirt), stumps, grass clippings, flowers, weeds, plants, leaves, lumber or anything in plastic bags or other such containers. This brush pick-up program is for the sole use of the residents of unincorporated Winfield Township, and shall not be used by contractors and/or residents clearing lots for homes, private roads, entrances or more open space. 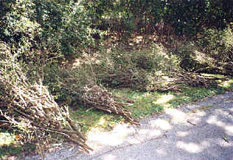 Cutting down a tree is not considered to be trimming or pruning and the Township will not remove the debris. GUIDELINES: Brush must not be placed on the parkway any earlier than the Saturday before the scheduled Monday pick-up in the area. All brush must be cut in lengths up to six (6) feet and no larger than six (6) inches in diameter. ALL BRUSH PLACED ON THE PARKWAY FOR PICK UP MUST BE SECURELY BUNDLED WITH BALING TWINE (which can be purchased at your local hardware store.) NOT WIRE, and each bundle shall not exceed 50 pounds in weight. Cut ends facing out! Not in roadway! For future pickup, brush must look similar to this. Items that do not conform to these guidelines will not be picked up by the Township and will be the sole responsibility of the homeowner as to their proper disposal. *Note – Anything over 6″ in diameter should be cut into fireplace-length logs and used as such. Please do not “hide” thorny tree branches (such as Olive or Washington Hawthorne trees) inside piles. Place these next to larger piles and our crews will take them. They need special care; they can cause injury. If there is a question regarding brush placement, please give our office a call at 630-231-8850. STORM DAMAGE: One week after a severe storm the Township may start brush pick-up to remove debris. A severe storm is defined as a storm producing enough damage that the Township road crews need to clear roads and Rights-of-Ways of trees/branches for traffic. Please follow the brush pick-up guidelines; branches need to be bundled and tied securely with baling twine. 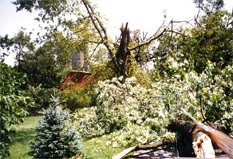 Should a tree come down during a storm on private property it is the responsibility of the homeowner for its proper disposal. Disposal of Christmas Trees – The Road District does not conduct a special pick-up for Christmas trees, the trees will be removed by your garbage hauler.